In the previous page we talked about the difficulties of treaty verification and the concept of physical cryptography. We also discussed the importance of the resonant behavior in allowing one to create a truly unique tag of a specific isotopic-geometric object. Nuclear Resonance Fluorescence is one example of a nuclear resonance. It is however by no means the only one. And the photons are not the only particles which can trigger such interactions. Any nuclear engineer who has ever solved a problem related to a reactor knows about neutron induced resonances. Heavy nuclei, such as those of uranium and plutonium, are highly complex systems, with many nucleons crammed together by the strong force. The more participants in the system, the more possible combinations of energetic states. This makes for a very high density of states - many, many resonances in the ~keV epithermal range, and less so at lower energies, where the distance between the resonances becomes larger. The plot on the right shows the cross sections - the probabilities - of neutron induced interactions in a variety of plutonium isotopes. 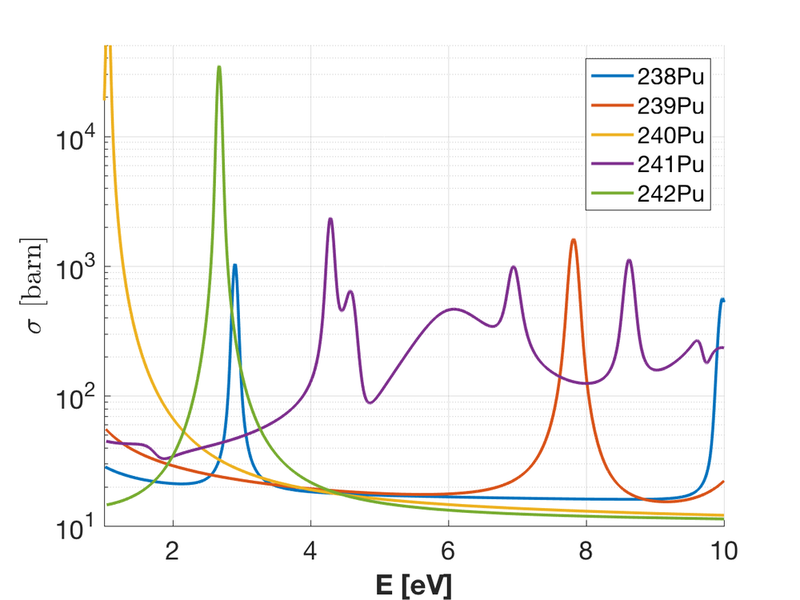 The peaks in the plot tell us that if a neutron at the energy of the peak were to interact with that nucleus, there would be a very high probability of it being absorbed. By looking at the transmitted beam energy distribution you can tell which isotopes were present - and this will give you that isotopically unique tag that you need. But here's the problem - if you do a direct measurement you'll learn everything about the weapon. So how do you avoid that? How do you achieve what we discussed earlier - a zero knowledge verification protocol. To do this, we combine the measurement of an object - e.g. a plutonium pit (the nuclear core of the weapon) - and add a reciprocal. The reciprocal is the "inverse" of the pit. Such that when you project them onto each other you get a uniformly flat object. This will guarantee that the transmitted image is just a flat one. The figure on the right shows both the pit and the reciprocal, lined up with the beam. Any green arrow will observe the same amount of material. And the image will come out flat -- as long as the pit is authentic. Otherwise the image will not be flat. Below you can see the Monte Carlo simulations of three radiographs: (a) honest pit (matches the reciprocal, hence the resulting image is flat); (b) fake pit, revealing the structure of the pit itself; (c) is the radial comparison of the two shapes. (a) and (b) do not match - this is an alarm. While the images are great at catching the hoaxes, they are by far not the only thing that allows us to do that. The spectral information of the neutrons that hit our detector tell a whole story as to whether the hosts are honest or are cheating. To the right is the comparison of what the spectra from the above two object look like. The discrepancy is obvious. The above is just a snapshot of the concept. If you want to learn more read the paper below. By the way, the study is based on the results of Jake's undergraduate thesis - not bad!